The conveyor system, along with that attached packout table, can be raised or lowered to best compliment different employees for better ergonomics. Jim Natzke | Dorner Mfg. Corp.
Providing consistent, reliable service, combined with this country’s insatiable appetite for cheese helped grow Alpine Slicing & Cheese Conversion’s business since its founding in 2006. Being located in the heart of America’s Dairyland in Monroe, Wisconsin, the company’s ownership team boasts more than a combined 100 years of experience within the cheese producing and packing industry. Today, its 100 employees create retail, foodservice and specialty packaging of up to 700 SKUs for more than 30 private-label brands. “Knowing the limitations of our original tray line, we thought for this new one let’s just approach it differently and see if we can do it better,” he said. 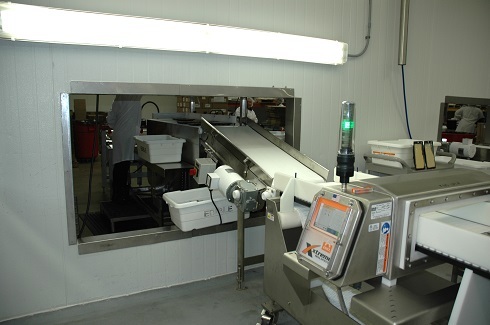 On the original tray line, cheese is sliced, packaged and placed onto a conveyor, which passes product through a metal detection unit. Then, the conveyor deposits the cheese onto a large rotating lazy Susan-type round table, which is used to accumulate cheese as the two employees grab the packages and load them into packing boxes in preparation for shipment. The main issue with this line is the height of the conveyor and position of the rotating table, both of which are a few inches lower than Natzke would like. This leads the employees packing cheese from the line to constantly be bending over to grab the cheese from either the conveyor, or reaching out to get cheese trays from the rotating table. The process was causing the employees to perform a lot of extra motion to package cheese, and that was one thing Natzke wanted eliminated with the new line. 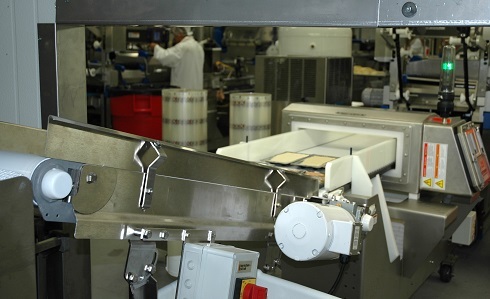 And that solution involved two Dorner AquaPruf conveyors, along with a packaging table – all of which are adjustable in height to accommodate Alpine Slice’s employees. 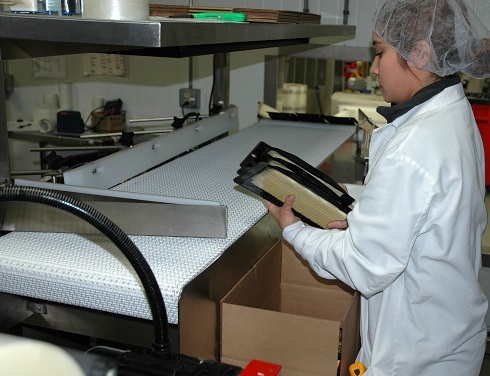 After cheese trays are packaged from the sealer machine and pass through a metal detector, they transfer onto the first AquaPruf conveyor that’s positioned at 25° incline angle. 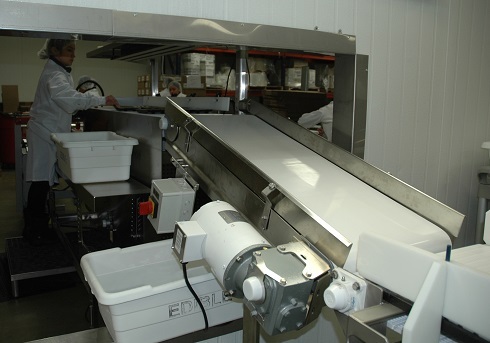 This four-foot long conveyor brings packaged cheese up to proper height for handling, and also uses a higher friction belt to prevent the trays from slipping. This new design, which was installed in fall 2015, offers several advantages over the original tray line. First, the conveyor system, along with that attached packout table, can be raised or lowered to best compliment different employees for better ergonomics. Second, trays arrive to the pack station properly oriented, making it easier and quicker for employees to handle and pack, as opposed to handling twisted and turned trays from the rotating table. Dorner’s AquaPruf sanitary conveyor platform are designed for the food and medical industries, and met various BISSC, NSF, USDA and FDA regulations for safe and effective operation. The platform provides the highest level of sanitation and fast cleaning times as the conveyor can be completely disassembled by one person, without tools, in less than 90 seconds. Natzke said production shuts down between 1 and 5 a.m. every day for cleaning of equipment by a sanitation crew, so time is of the essence. Natzke said the line is performing well, and is planning on replacing the original tray line with a duplicate design from Dorner.